Ahhhh I've eaten too much over Christmas! Healthy eating (and drinking) is a bit of a cliché in January but you can see how it happens. Christmas is great but you feel so out of routine eating things you normally wouldn't... You even lose track of the days of the week! So I'm using Tombo Matcha tea to bring me back down to earth. I then saw the Juicing Man on This Morning and decided that if he can add turmeric to his smoothies then I could try it for my matcha. It's a natural anti-inflammatory so it's great to get some in each day if possible! I'm really enjoying the taste actually, especially with a dash of honey. 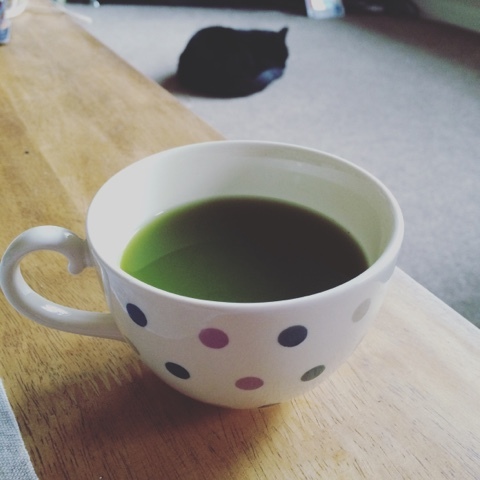 I think I'll do this each time now as matcha wasn't my favourite taste but the turmeric makes it much more my cuppa tea!